At present there are no known procedures for preventing or treating infectious diseases of corals. Toward this end, the use of phage therapy has been investigated. Lytic bacteriophages (phages) were isolated for two bacterial pathogens that are responsible for coral diseases, Vibrio coralliilyticus, which is the causative agent of bleaching and tissue lysis of Pocillopora damicornis, and Thalosomonas loyaeana, which causes the white plague-like disease of Favia favus. By using these phages in controlled aquaria experiments, it was demonstrated that each of these diseases could be controlled by the pathogen-specific phage. The data indicate that initially the phages bind to the pathogen in seawater and are then brought to the coral surface where they multiply and lyse the pathogen. The phages remained associated with the coral and could prevent subsequent infections. These data suggest that phage therapy has the potential to control the spread of infectious coral diseases. Communicated by Biology Editor H.R. Lasker. 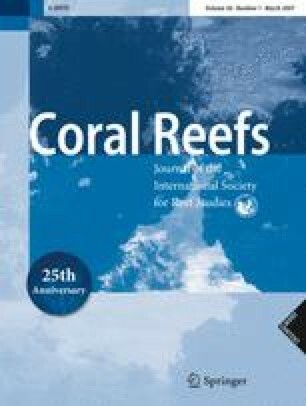 Infectious diseases of corals cause serious damage to coral reefs throughout the world (Green and Bruckner 2000; Harvell et al. 2002). In several cases, the microorganism responsible for the disease has been identified (Kushmaro et al. 1996; Richardson 1998; Ritchie et al. 2001; Rosenberg and Ben-Haim 2002). It is now clear that environmental factors, especially increased seawater temperature and pollution, contribute to disease formation (Rosenberg and Ben-Haim 2002; Bruno et al. 2003; Kerri et al. 2004; Kuntz et al. 2005; Kline et al. 2006), and every effort should be made to avoid these deleterious factors. However, it is equally important to develop therapeutic methods for preventing and curing infectious diseases of corals. Two widely used methods for controlling human diseases, immunization and antibiotic treatment, are not applicable to coral diseases because corals have no adaptive immune system (Nair et al. 2005) and introduction of antibiotics in an open system like a coral reef is not practical. An alternative therapeutic method is phage therapy. The use of bacterial viruses (bacteriophages, or phages for short) for the treatment of human disease has had a long and rocky history (Lederberg 1996; Chanishvili et al. 2001; Sulakveldize et al. 2001). However, many of the intrinsic difficulties of treating humans by phage therapy are irrelevant to corals, such as uptake of the phages by the spleen, and destruction by opsonization and neutralizing antibodies. The major advantages of phage therapy of coral diseases are host specificity, self replication and environmental safety. The phage only attacks and destroys the specific pathogen, leaving the remaining beneficial microorganisms untouched. The phage multiplies rapidly at the expense of its host bacterium, increasing the phage titer for more effective control of the pathogen. When the pathogen concentration decreases sufficiently, the phage will also decline (Weld et al. 2004). Phage therapy has been used to protect fish against experimentally-induced bacterial infections in aquaculture (Nakai and Park 2002). In this study, the application of phage therapy was tested with two coral diseases: tissue lysis of Pocillopora damicornis by Vibrio coralliilyticus (Ben-Haim and Rosenberg 2002; Ben-Haim et al. 2003a, b) and the white plague-like disease of Eilat (Gulf of Aqaba, Red Sea) corals caused by Thalosomonas loyaeana (Barash et al. 2005; Thompson et al. 2006). V. coralliilyticus is a novel species that has been recently isolated from diseased corals and other marine invertebrates in the Red Sea, Indian Ocean, Atlantic Ocean and Great Barrier Reef (Ben-Haim and Rosenberg 2002; Bourne and Munn 2005). At 25°C, V. coralliilyticus causes bleaching of P. damicornis in 20–25 days, whereas at 27–30°C the pathogen causes tissue lysis and death in 10–15 days (Ben-Haim et al. 2003 a, b). The white plague-like disease is currently the most serious disease on the Eilat coral reef. T. loyaeana, is the causative agent of this disease on several large corals, including Favia favus, Platygyra sp. and Goniastrea sp. Approximately 10% of the colonies of each of these genera show progressive signs of the disease or are dead as a result of the infection. In the field, the disease spreads within the colony at a maximum recorded rate of 11 mm per day (Barash et al. 2005). Strains were routinely cultivated in liquid MBT medium (1.8% Marine Broth, 0.9% NaCl and 0.5% Difco Tryptone) at 30°C. Liquid cultures were prepared in 125 ml flasks containing 10 ml MBT, inoculated with one colony, and incubated at 30°C with shaking (160 rpm) for 48 h. The strains were maintained on MB Agar (1.8% Marine Broth, 0.9% NaCl and 1.8% Bacto Agar). Stock cultures were stored in 15% glycerol at −70°C. Seawater was collected from the Red Sea near the Intrauniversity station in Eilat, Israel. Aliquots of 500 ml were filtered through 0.22 μm membrane filters (Millipore). The filtrates were then concentrated 100-fold (TFF-Tangential Flow Filtration) and either plated directly or were used in enrichment cultures. Plaques were obtained over lawns of the different hosts: V. coralliilyticus or T. loyaeana by the soft agar overlay technique (Adams 1959), using 0.6% agar and incubating at 30°C for 24 h. Several rounds of plaque purifications were performed to ensure a pure phage stock. High titer stocks were made by infecting fresh culture of bacteria (A 600 = 0.6) with approximately 1 × 106 pfu ml−1. After about 2 h the culture became clear and was centrifuged to remove any remaining bacteria and large debris. Phages were classified on the basis of morphology determined by electron microscopy. High titer bacteriophage lysates were negatively stained with 1% uranyl acetate and examined with a JEOL 840A electron microscope at 80 kV. Corals for laboratory infection experiments were collected by SCUBA diving off Eilat in the Gulf of Aqaba, Red Sea, from depths of 2–6 m. In the case of P. damicornis, ca. 2 cm2 pieces were taken from the same colony. With F. favus, each piece was a separate small colony (ca. 3 cm diameter). The corals were then allowed to recover and regenerate in 3–10 l, glass-covered aerated aquaria at the same seawater temperature (21–26°C) at which they were collected. After tissue recovery the corals were slowly acclimated to the experimental temperature by increasing the temperature no more than 0.5°C per day. The corals were maintained at the experimental temperature for a further 7–14 days prior to the experiment. If any fragment failed to heal (completely cover over the broken edges with new tissue, and exhibit dark pigmentation), it was not used in the experiments. The corals were maintained in freshly prepared artificial seawater (ASW, Instant Ocean, USA) adjusted to salinity of 35–37 ppt. Water was replaced every 3–6 days. The aquaria were aerated and illuminated with fluorescent lamps (Sylvania, Aquastar 10,000 K) by using a regimen of 12 h light:12 h of darkness. Overnight cultures of V. corallilyticus and T. loyaeana were transferred to fresh MBT medium and allowed to grow until they reached A 600 = 0.4 (exponential phase). The cultures were then centrifuged, and the pellets washed and resuspended in either MBT medium or ASW. To prevent multiple adsorptions, the adsorption experiments were performed with final concentrations of 5 × 106 and 5 × 105 ml−1 of bacteria and phages, respectively. Samples were withdrawn at timed intervals and diluted 100-fold to prevent further adsorption. The suspension was then centrifuged for 2 min at 8,000g to remove adsorbed phages, and the supernatant fluid (containing free virons) was assayed for phage by the soft agar overlay technique. One-step growth curves for each phage was performed as described in Adams (1959). Healthy F. favus and corals showing signs of the white plague-like disease (ca. 3 cm diameter) were placed in separate aquaria and maintained as described above at 25°C. After 48 h, 300 ml of water from the aquarium with the diseased coral and 300 ml of artificial seawater were placed in each of nine aquaria. A single healthy coral was then placed in each aquarium. Six aquaria were inoculated with phage BA3 (three received 104 pfu ml−1 and three received 106 pfu ml−1). The other three aquaria served as no phage controls. Coral fragments were placed in 2.5 l aquaria containing 2 l of freshly prepared artificial seawater (4 or 5 corals per aquarium). All four aquaria were then infected with a 48 h culture of V. coralliilyticus at a final concentration of 105 bacteria per ml. Two aquaria containing a total of nine corals served as the no-phage controls. The other two aquaria containing a total of nine corals were inoculated with phage YB2 to reach 103 ml−1. Seawater in the aquaria was replaced every 7 days by removing the corals, draining and rinsing the aquaria, and adding back the rinsed corals to fresh seawater. Bacteriophage preparations (at least 109 pfu ml−1) were treated with DNase I and RNase A at 37°C for 15 min to remove contaminating nucleic acids, then precipitated by 20% PEG (containing 2 M NaCl), lysed by addition of EDTA (final concentration 20 mM) and SDS (final concentration 0.5%), followed by incubation at 68°C for 5 min. The nucleic acids were purified using a phenol, phenol/chloroform, chloroform extraction, and precipitated with ethanol (Sambrook et al. 1989). The DNA of phage YB2 was fragmented by the EcoRI and PstI. The DNA of phage BA3 was fragmented by the following enzymes: BamHI, HindIII, EcoRV and EcoRI . All restriction enzymes used were products of Fermentas Inc., Hanover, MD, USA. 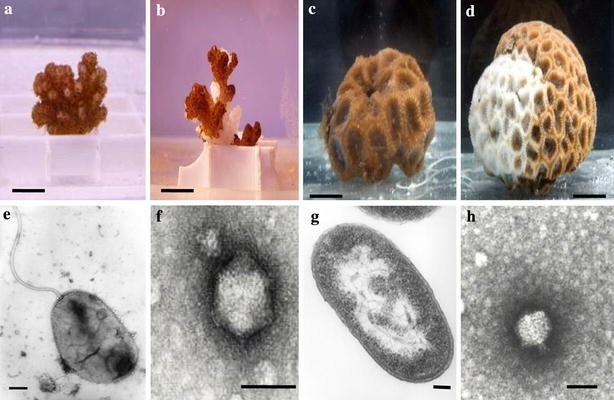 Figure 1 presents photographs and electron micrographs of healthy and diseased corals, bacterial pathogens and phages used in this study. The natural concentrations of phages in the seawater surrounding the corals that formed plaques on V. coralliilyticus and T. loyaeana were 5 and 1 per ml, respectively. One distinct phage for each bacterial pathogen was obtained after several rounds of plaque purification. Phage YB2 (obtained after enrichment) formed 1.5 mm clear plaques on V. coralliilyticus. It is a double stranded DNA phage containing 11 Kbp of circular DNA (Fig. 2). The uncut DNA (Fig. 2, lane 4) shows the typical three forms of circular DNA, and a single cut (Fig. 2, lane 3) yielded the single linear form. One-step growth curves of phage YB2 on V. coralliilyticus yielded a burst size of 100 in 80 min at 30°C. Phage BA3 (obtained by direct plating), which formed 2 mm clear plaques on T. loyaeana, is a double stranded DNA phage containing 15 Kbp of linear DNA (Fig. 3). One-step growth curves of phage BA3 on T. loyaeana yielded a burst size of 150 in 120 min at 30°C. Based on their structural morphologies as observed by electron microscopy, phages YB2 (Fig. 1f) and BA3 (Fig. 1h) were classified as belonging to the Corticoviridae (chloroform sensitive) and Podoviridae groups, respectively. Both phage YB2 and BA3 are highly specific for their respective hosts. Neither forms plaques on a variety of other marine bacteria tested. In addition, each phage only attacks its specific host and not other strains of the same species. For phages to be effective in preventing bacterial infections of corals, the phage must be able to adhere to the pathogen in unsupplemented seawater. As summarized in Figs. 4 and 5, both phages YB2 and BA3 adhered to their hosts in seawater, albeit at a slower rate than in MBT medium. Approximately 60% of the input phage YB2 was bound to V. coralliilyticus in 90 min in ASW, whereas 90% was bound in 10 min in MBT medium. Adhesion of phage BA3 to T. loyaeana was only slightly slower in ASW than in MBT medium. In both cases, over 50% were bound in 10 min. When bound to their hosts in seawater, phages YB2 and BA3 did not multiply or lyse the bacteria, but when transferred to nutrient rich MBT medium, the bound phages multiplied rapidly and lysed the bacteria (data not presented). Phage YB2 protected the coral P. damicornis against infection by V. coralliilyticus (Fig. 6). In each of the aquaria that did not receive phage, all nine corals began to lyse after 14 days and were completely devoid of tissue after 17 days. In the aquaria that contained 103 phages per ml, all corals remained healthy for at least 2 months. In a separate experiment, corals that were inoculated with V. coralliilyticus and phage YB2 and remained healthy for 33 days, were re-inoculated with the pathogen. These corals remained healthy for an additional month (Fig. 7). Since the phages were only added at the beginning of the experiment and the water was replaced weekly, it follows that sufficient phage remained associated with the coral tissue for at least 1 month to protect against the second infection. The death of the corals after 27 days (Fig. 7) was probably not the result of infection with V. coralliilyticus because the pathogen could not be isolated from these diseased corals. The most rapid and reproducible technique for transmitting the white plague-like disease in the laboratory is to place a healthy coral in water that came from an aquarium containing a diseased coral (Fig. 8). In the absence of added phage, all the corals began to show tissue lysis in 2 days and were dead in 4 days. The corals that were treated with phage remained alive with no tissue loss for at least 21 days. The only difference between them and healthy non-infected corals was that the phage-protected corals secreted more mucus than healthy control corals for the first 3 days after infection. Both 104 and 106 ml−1 phages showed the same inhibition of infection. During the phage therapy experiment, the concentration of phage BA3 in the aquarium water increased more than 100-fold during the first 2 h and remained high throughout the experiment (Fig. 9). After 7 days, a coral was removed from the aquarium, rinsed and then crushed in sterile seawater. The titer of phage BA3 was 7 × 106 pfu cm−2, indicating that phage remained closely associated with the coral tissue. The data presented here demonstrate in two coral model systems that inoculation of specific phages at the same time as the bacterial pathogens inhibits infection in aquaria. Since the rate of phage adsorption to its host was relatively rapid (minutes) compared to bacterial adhesion to the coral (hours), it is reasonable to assume that the phage was carried to the coral while bound to the bacterial pathogen. Once the pathogen reaches the nutritionally rich coral mucus, it begins to metabolize, allowing for phage multiplication and resulting bacterial lysis. This concept is supported by the observation that there was more than 100-fold increase in phage BA3 during the first 2 h. The titer of phage associated with coral tissue remained high for several weeks. This important finding can explain (1) how the phage titer in the water was maintained even after the water in the aquarium was replaced—by release of phage from the coral, and (2) how corals treated with phage and pathogen at day one showed increased resistance to a second bacterial infection after 33 days (Fig. 7). Because of the high degree of host specificity, phage therapy provides an indirect but powerful tool to demonstrate that a particular microorganism is responsible for a specific disease. This is particularly relevant to the white plague-like disease, because it has not been possible to reproducibly isolate T. loyaeana from diseased corals showing signs of the disease (Barash et al. 2005). The difficulty of isolating T. loyaeana may be due to the large and diverse number of bacteria associated with corals (Rohwer et al. 2001, 2002; Koren and Rosenberg 2006), the lack of a specific medium for isolating the bacterium and/or that T. loyaeana may be in a viable-but-not-culturable (VBNC) state (Colwell et al. 1985). The data showing that the T. loyaeana-specific phage BA3 blocks the infection and that the phage multiplied on water taken from a diseased coral, demonstrate that T. loyaeana must have been present on the diseased coral and is responsible for transmitting the disease. Based on the known phage burst size, the presence of 108 pfu ml−1 2 h after infection (Fig. 9) indicates that the water taken from the aquarium that contained a diseased coral (day 0) must have had a concentration of T. loyaeana >105 ml−1. Thus, together with data previously published (Barash et al. 2005), all of Koch’s postulates have now been satisfied, and it can be concluded that T. loyaeana is the causative agent of the white plague-like disease on the Eilat coral reef. Before applying phage therapy to coral diseases in an open system, such as a coral reef, three problems have to be addressed: the most appropriate time to add the phage, possible development of phage resistance by the pathogen and obtaining enough phage for a field trial. At present, we do not know the outcome of the bacterial infections when the phages are added before or after the bacteria. This needs to be studied. If phage resistance becomes a problem, it may be necessary to use a “cocktail” of phages (O’Flynn et al. 2004). The frequency of mutation of two or more phages is extremely low. Regarding the number of phages needed for a field trial, let us assume that 103 phages ml−1 will prevent the spread of the disease. (This value is 1,000 times higher than their natural abundance in Eilat seawater). A titer of 1011 phages per ml can be reached in a fermentor. Thus, a 100-l laboratory fermentor will provide 1016 phages, enough to treat 106 m2 of a coral reef to a depth of 10 m. A commercial fermentor (e.g., 100 m3) would probably have to be used to prepare enough phage for treating large reef areas (e.g., 1,000 km2). Phage therapy of coral diseases appears to be achievable. 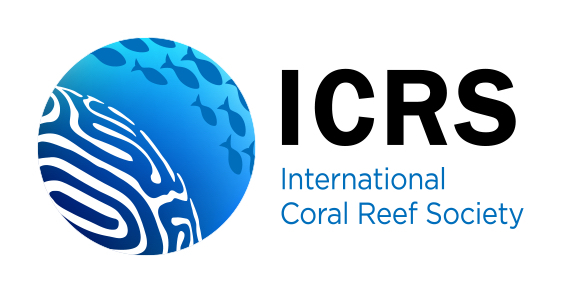 We thank L. Doron for helpful suggestions, R.J. Martinez, G. Cohen and D. Harvell for critical reading of the manuscript and Gil Sharon for assistance in collecting corals. This research was supported by grants from the Israel Center for the Study of Emerging Diseases, the Israel Science Foundation and the World Bank Coral Disease and bleaching Groups.